Jiangjin (Chinese: 江津; pinyin: Jiāngjīn), one of the districts in the southwest of Chongqing, China, lies along the upper reaches of Yangtze River, and has a history extending back more than 1500 years. The district covers 3200 square kilometres and has a population of 1,460,000,[when?] and borders the provinces of Sichuan to the southwest and Guizhou to the south. The county seat and central town of Jiangjin is 50 km (31 mi) away by highway, 65 km (40 mi) away by railway and 72 km (45 mi) away by waterway from Yuzhong of central Chongqing. Jiangjin District administers 23 townships and 3 subdistricts. Jiangjin enjoys a history of more than 1500 years. Established in 487 C. E., Jiangzhou County was renamed Jiangyang County in 557 C. E. and renamed Jiangyang County in 583 C. E. In 1983, Jiangjin County placed under the administration of Chongqing city. However, in 1992, the Jiangjin County was promoted to a city level, and was called Jiangjin City. In 2006, the status of Jiangjin City was changed to Jiangjin District, Chongjin, a county-level division of Chongqing. 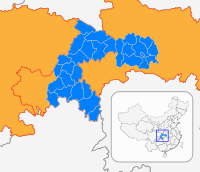 Jiangjin lies within central China at 105°49′—106°38′of longitude and 28°28′—29°28′of north latitude. The landscape and topography of Jiangjin slopes from high elevations in the south and low in the north. Luohuangzhongba stands at the lowest elevation (178.5 m). The highest site, Wugongba in Simian Mountain, reaches an elevation of 1709.4 m. The average elevation of downtown Jiangjin is 209.7 m, with a flood stage designated at an elevation of 199.13 m.
The subtropical monsoon climate features an annual average temperature of 18.4 °C (65.1 °F), a monthly average temperature of 7.7 °C (45.9 °F) in January and 28.5 °C (83.3 °F) in July, with total annual radiation of 1273.6 hrs, total annual rainfall of 1,030.7 mm (40.58 in), a frost-free period of 341 days and annual average relative humidity of 81%. At present, six national-level highways provide transportation corridors to Jiangjin. For example, both the Chengdu-Chongqinq and Yuqin freeways serve to ease traffic problems in Jiangjin. The Luohuang Yangtse River Railway Bridge and Jiangjin Yangtze River Bridge provide convenient access to Jiangjin. The Yangtze River pass through Jiangjin, creating a 305 km (190 mi) long waterway when including tributary waterways in the District; Jiangjin has five nationally recognized deep-watered ports along its rivers. Well connected to main city centre via three major highway. Just 50 mins drive from airport to Jiangjin. Jiangjin, as one of several citrus producing areas in China, has a long history of citrus cultivation. The 'Jincheng' orange originated here. Major agricultural products include rice, wheat, soybean, sweet potato, pepper corn, vegetables and fruits. Animal husbandry includes pig farms and fisheries. In 2006，the total annual GDP was CNY14.894 billion and the annual average income per copita is CNY10,458 in Jangjin. It posted the 7th highest GDP in 2016. Zhiping country is the key focus of high end development in 2017. Large Chinese residential developers were turned away without an exciting development proposal despite offering high RMB2m per acre. Third Communist Liberation Army will be relocated to Zhiping with a massive 1500 acres of land, providing medical services, military training and housing facilities for high-ranking military officers and families. One of the tourist attractions in Jiangjin, Simian Mountain, is known for its natural environment, forests, lakes, rivers and waterfalls. It is located approximately 140 km (87 mi) from the Chongqing downtown area. Another tourist attraction is the Zhongshan Ancient Town, with a historical record of its existence dating 850 or so years back to the Song Dynasty. A more recent tourist attraction is Aiqing Tianti, a mountain path with 6,000 steps built by Liu Guogang for his wife Xu Zhaoqing. The path is seen as a symbol of dedication and love between Liu and Xu and tourists visit the path to their secluded home. Jiangjin is known for its production of Laobaigan, a strong limpid liquor usually with an alcohol level of near or above 60 proof. Mihuatang, sweet and crisp dessert produced in Jiangjin, is mainly made of puffed rice and sesame. Agriculture grown in Jiangjin are known to be cancer preventing as such they are renown for the number of centenarians. ^ shi, Guo wu yuan ren kou pu cha ban gong; council, Guo jia tong ji ju ren kou he jiu ye tong ji si bian = Tabulation on the 2010 population census of the people's republic of China by township / compiled by Population census office under the state; population, Department of; statistics, employment statistics national bureau of (2012). Zhongguo 2010 nian ren kou pu cha fen xiang, zhen, jie dao zi liao (Di 1 ban. ed.). Beijing Shi: Zhongguo tong ji chu ban she. ISBN 978-7-5037-6660-2. This page was last edited on 27 March 2019, at 16:39 (UTC).